brown bread recipe collection. Indian brown bread recipes. Brown bread is variety of bread that is popularly eaten throughout the world. Unlike white bread, this is made with whole wheat flour, water, sugar, yeast and salt instead of maida. It is considered to be a healthier alternative to white bread as it has more fiber, minerals and vitamins. Brown bread is available in many forms like whole wheat buns or loaves or even sliced bread. Even though available in so many forms, in India it is commonly associated with sliced bread. Snacks are in integral part of everyone's day and it usually results in us snacking on unhealthy things. Instead of eating the unhealthy white bread, it is better to eat the healthier brown bread. There are a variety of toasts and sandwiches that can made with it to get that touch of healthy to your food. Crispy Spinach and Paneer Open Toast has a really great texture with crumbly paneer and crunchy toast that go really well together. A different flavor combination would be buttered toast with soft mushrooms and tangy tomatoes. Tie it all together with oregano and you have the amazing tasting Mushroom Oregano Open Toast Sandwich. A quick alternative to the burger, just make simple crispy tikkis, stack them up with fresh lettuce leaves, some sweet carrots, place them between two slices of brown bread and enjoy a very desi version in this Potato Tikki Sandwich. What makes this desi is the tangy amchoor and kalonji added to the potato mixture. A vitamin rich, healthy option is a sumptuous Carrot and Paneer Toast. This toast shows how simplicity works at its best with non-complicated flavors coming together for a healthy meal. Combining an unusual spectrum of ingredients together is a lot of fun. Carrot, Apple and Date Sandwich is a sandwich that combines the sweet apples and dates with the salty cheese and a carrot spread. This unique twist makes breakfast's all the more fun to eat. Another interesting way of using brown bread is to turn it into the outer covering for samosas. You will definitely fall on love with these Baked Samosas which are a much healthier version than the original deep fried ones. 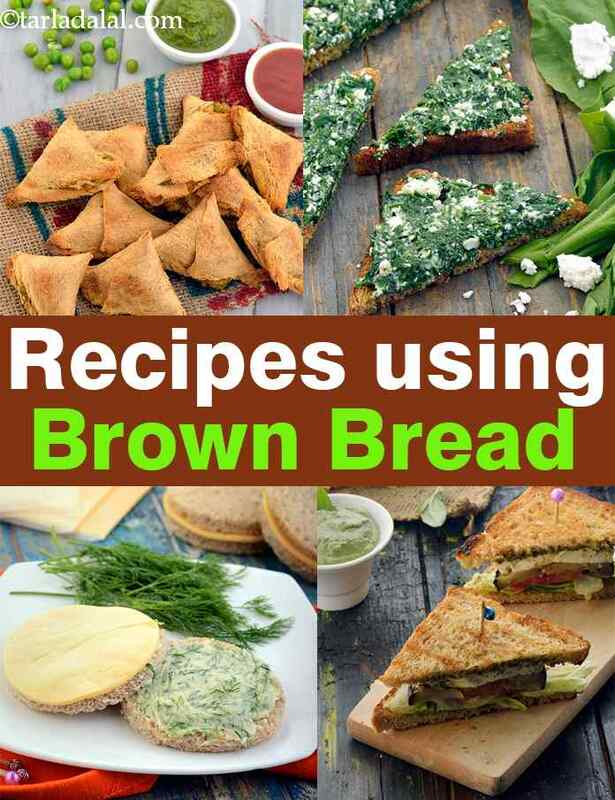 Enjoy our brown bread recipe collection, Indian brown bread recipes given below. If you remember the popular british airways ad, "kids walk to school and run back home. " and well, probably in anticipation of the snacks you'd have laid out on the table! treat them to these tasty and healthy whole wheat bread rolls stuffed with a combination of veggies and mayonnaise. Hmmm. . . . The name itself sounds so interesting! pineapple and paneer together rocks in this sandwich where addition of sugar gives that extra sweetness loved by kids! serve these as breakfast or evening snack! Baked noodles with brown bread is a healthy and mouthwatering combination and makes for a lovely tiffin or meal choice. Find a vast collection of bread recipe, the baked noodles recipe and many more. Baked corn on toast is a baked low cal sandwich recipe with corn as topping. The delectably crispy sandwich recipe is perfect for evening tea time snacks and also serves as a healthy choice for school returned hungry kids.